Do you love cookies? We thought so! 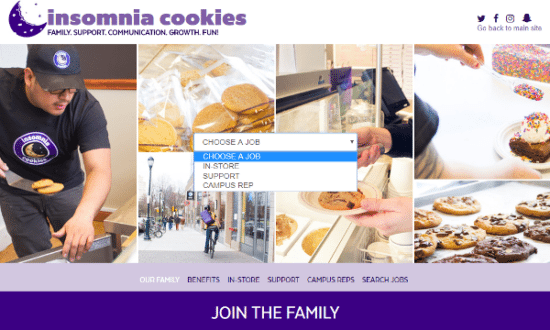 Turn that love for cookies into a career at Insomnia Cookies. Insomnia Cookies believes in five core values: Family first, Support, Growth, Communication, and Fun. They believe these core values keep them grounded and help them in all business endeavors. If this sounds appealing to you follow along with this guide to apply either online or in person. 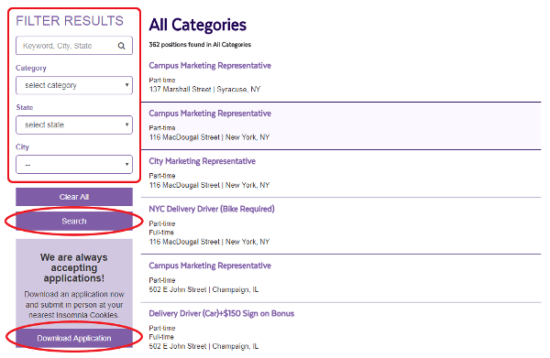 Step 1 – Go to the careers page on the Insomnia Cookies website. You should see something similar to the screen grab below. Step 2 – Now, you can select what type of job you would like to apply for from the drop down menu in the center of the screen. It gives you the option of In Store, Support, and Campus Rep. Step 3 – However, we recommend just selecting “View all jobs,” so that you can see all of the job postings and get a better idea of what you would like to apply for. Now, you can either look through all of the job postings or search through them by keyword, category, state or city (outlined by the red rectangle below). Step 4 – Enter your search criteria and click on the search button. The available jobs will be listed to the right of the page. Step 5 – Find a job that interests you and click on it to apply. There is also a place for you to upload a resume if you have one. Once you have filled out the application just click on the Submit Application button at the bottom of the page and you are all done. Step 1 – Download the application. Step 4 – In the Legal section, check yes or no to the 3 questions. Step 5 – Fill in your relevant work history. Its always a good idea to put your last or current job at the top of this section. Step 6 – Give some references that the company could contact on your behalf. Then read the information in the last box carefully. Step 7 – Sign on the line and write in the current date.